As I start this new blog, I thought it may be helpful to post some of my older models to show what I have done, and give a little history to my designs. In the midst of getting into Trial Trucks, I decided it was time to make a new smaller truck. I designed a mini truck, to test my abilities with smaller functions based on the Oshkosh LMTV military truck, and to take my mind off the design that was taking most of my time. 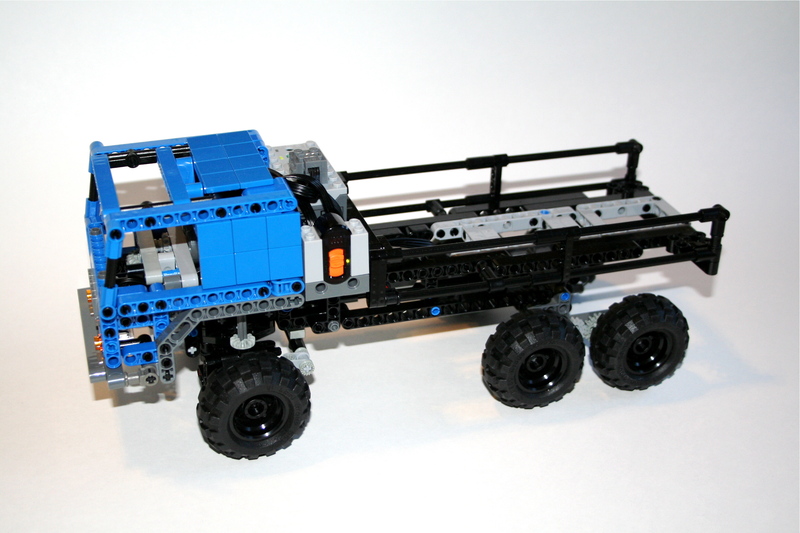 I chose the six wheel truck as it would make the suspension of the truck a little more simple than other designs. The rear axles would be tied together on each side, with a pivot point in between each wheel; one for each side. A single axle would connect both sides through the dual pivot points, and would be powered by a worm gear directly from the drive motor. This set-up did not require any additional suspension components, and this would allow the front axle to use an unsuspended pendular set up. The PF M drive motor was placed above the rear wheels and drove an axle that would go to both the front and rear axles. Like the rear, the front axle would use a worm gear directly from the motor to drive the wheels. From the worm gear, a 8z gear was used to drive two 12z double bevel gears for each wheel. Both 12z gears would drive two more 12z double bevel gears to which allowed for drive through the steering axis. A simple link connected the two steering wheels, and used a rack and pinion setup to transmit the steering function. It worked well, and allowed the steering motor to slip at steering lock. A PF M steering motor was placed above the front axle in the cabin. I created a small bed, and cabin for the truck and decided to build the truck in blue. As I was browsing through my Brickshelf folder, I noticed I had too many red vehicles, so something blue would be good. I placed the 8878 battery box, and PF receiver between the cab and the bed. This allowed for proper center of mass, and gave me a fully functioning bed. The model worked well. For such a small vehicle, it took a lot to stop the truck, in part because of the worm gears. The steering worked well, but the turning radius was limited, due to the poor steering lock. I was a fun model, and it is still one of my more popular projects on Flickr. See the full brickshelf gallery for a more complete view.